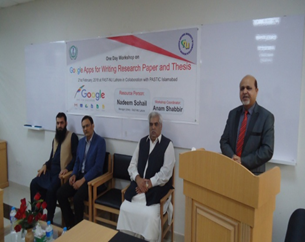 PASTIC Sub Center Lahore organized one day workshop with collaboration of FAST-NU Lahore on “Google Apps for Writing Research paper and Thesis”, on 21th February 2018, at FAST-NU Lahore. A total of 42 participants from FAST, others universities and libraries participated in this workshop. This event was successfully conducted with the collaboration of PASTIC and FAST- National University of Computer & Emerging Sciences. Director-FAST NU, presented welcome note in which he introduced FAST as academic institute and underlined its role in quality education. Dr. Kashif Zafar, HOD Computer Science Department, highlighted the importance of research and research tools assistance in this technological era. Mr. Ali Raza Khan, Deputy Director (STI), PASTIC, Lahore sub center gave an introduction about PASTIC and its services. 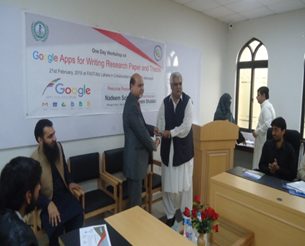 Mr. Nadeem Sohail, Manager Library was the key resource person and gave presentation on google Apps for researchers. The participants did 30 minutes hands on practice on Google searching strategies, google scholar, Google drive, Google docs, sheets and slides. Mr. Nadeem Sohail, presented the Google Forms, Google clouds search and trained the percipients about these apps. At the end, shields were distributed among guests and resource persons. Participants received their certificates. Dr. Amjad Hussain, Director, & Chief Guest of Workshop delivering a talk in Inaugural Session. Mr. Nadeem Sohail, Resource Person, delivering lecture to the participants. Mr. Ali Raza Khan Deputy Director (STI), PASTIC Present the shield to Dr. Amjad Hussain, Director, Chief Guest, FAST-NU Lahore.